The Faerie Review: Do Fairies Bring the Spring? to paint crocuses, lilacs, and daffodils? Everyone knows fairies love spring flowers and summer sun, but is it the fairies who wake up the earth as the snow melts? Do they entice the trees to turn green and the flowers to grow? 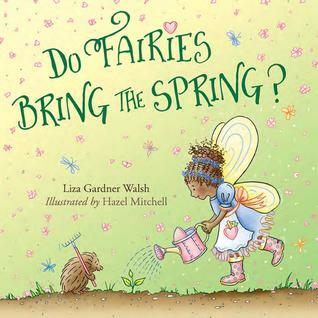 In this charming follow up to Where Do Fairies Go When It Snows, Liza Gardner Walsh, acclaimed author of the Fairy House Handbook and Fairy Garden Handbook, explores the matter in a children's picture book of rhyming questions. Combined with delightful illustrations by Hazel Mitchell this whimsical book will help children discover the world of fairies and learn to enjoy and appreciate the outdoors. Review: An instant classic, this beautiful book is filled with whimsical prose and illustrations. A great view on the awakening of life that occurs in spring, wrapped up with ways to help the fairies and welcome them. Highly recommend for the young and young at heart.